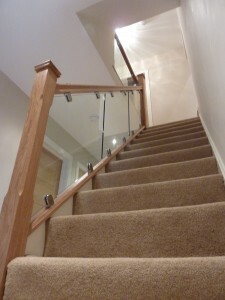 Glass stair balustrade is a balustrade system using toughened glass panels mixed generally with timber stairparts. Today, many new, high-spec. homes are using these systems in their construction because it is considered to be a beautiful and cost-effective solution through which light transcends and the polished edges of which, allow light to refract, creating a beautiful feature. For the home, few features are as safe and as aesthetically pleasing as the glass staircase, creating a first impression that is quite enthralling . The timeless beauty of glass mixed with timber, particularly oak or walnut creates a sophisticated, safe, and secure look for your interior space. At Beautiful Stairs, we take great pride in creating high quality glass balustrades combined with traditional timber stairparts systems for properties that need a more modern look. If you are a home owner who is interested in an upscale remodel of your staircase, we are here to help. Or a framed system with the same glass panels being set into the hand and baserails for a more sleek, simple look. See our portfolio for examples of both. All glass panels are bespoke and can be made to any combination of sizes to suit customer requirements, resulting in a staircase that is safe, stylish and unique.